Both comparative criticism and translation cross borders. Yet borders that have been crossed still exist. Even a border that has been dismantled is likely to reappear in a different place, or as a less obvious set of limiting practices: migrant texts and migrant ideas, like migrant people, may not achieve full citizenship in their new locations. Of course, there is a creative aspect to borders too, as postcolonial theory in particular has emphasized. Borders are contact zones (Pratt), generators of hybridity (Bhabha), spaces of exchange, cross-fertilization, and enrichment. 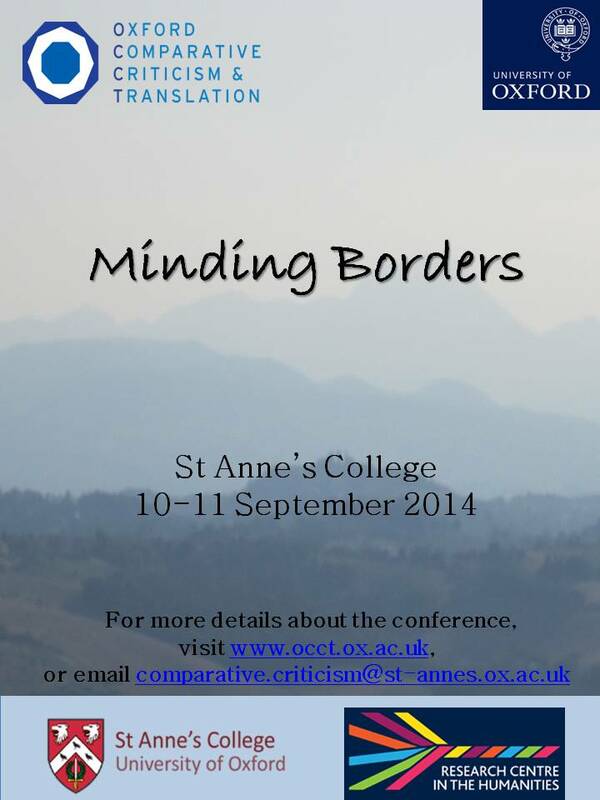 For all these reasons, borders require minding – thinking about, managing, even in a sense policing. Rather than celebrating the crossing of borders, or dreaming of their abolition, our conference traced their troubling and yet generative resilience. It explored how borders define as well as exclude, protect as well as violate, and nurture some identities while negating others. Contributors will think comparatively across geography, politics, cultural circulation, creativity, and the structuration of academic disciplines, hoping that the analysis of borders in one domain may illuminate their workings in another (and therefore reconfigure the borders between them). Whatever other form a border takes it is always also a border in the mind. 1) Davide Papotti (Parma) "Old and new borders: a geographical approach"
2) Caroline Bergvall (London) "Drifting in the seas of language"
3) Adrian Grima (Malta) "Mediterranean literatures and the borders of language and meaning"
4) Michael Wheeler (Stirling) "The edge of thought: extended cognition and the border between mind and world"